Just as I was snapping a photo of sizzling fish, Hubby walked in. “You know, G, there are millions of fish taco recipes on the Web. The world may not need another one.” Pish posh! 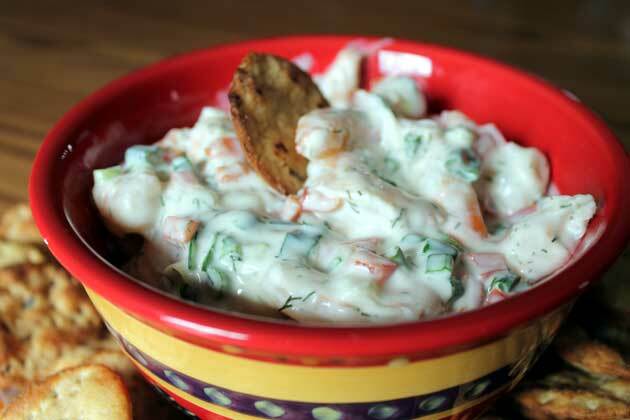 I’d be doing a disservice to cooks across all continents if I didn’t share my easy recipe! Really, these fish tacos standout because of the tasty marinade, easy preparation, and versatility in serving style. Don’t like to pan fry? Fire up the grill. Don’t care for cod? 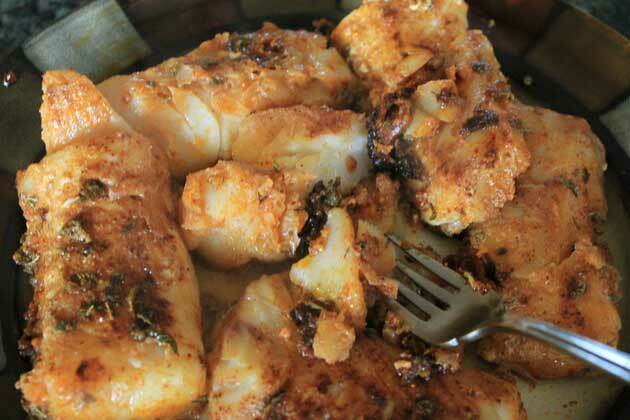 Substitute any firm fish such as tilapia or whitefish. Have an at-times overly direct, linear observant husband? Feed him fish tacos for dinner. And love him anyway. Easy Fish Tacos in 3 simple steps. Step 1: Mix all marinade ingredients and pour over fish. 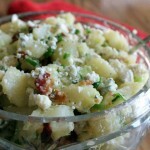 Refrigerate for 20 minutes while preparing sides. 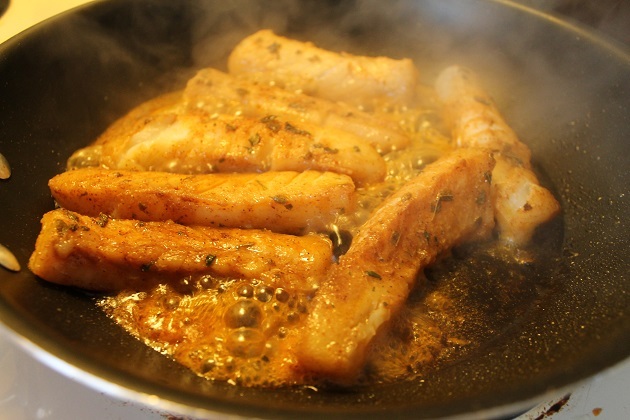 Step 2: Heat a non-stick skillet and pan fry fish in batches, 3-4 minutes on each side. Step 3: Plate the fish, put out the sides and enjoy! 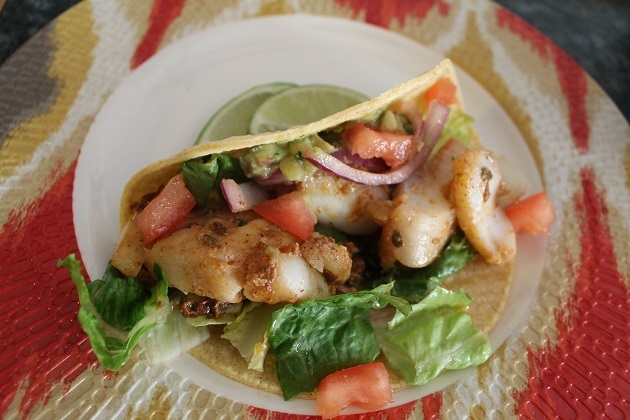 A flavorful marinade adds a tasty zip to cod, tilapia or whitefish and makes for a delicious and easy preparation for fish tacos. Mix first six ingredients to form a paste. 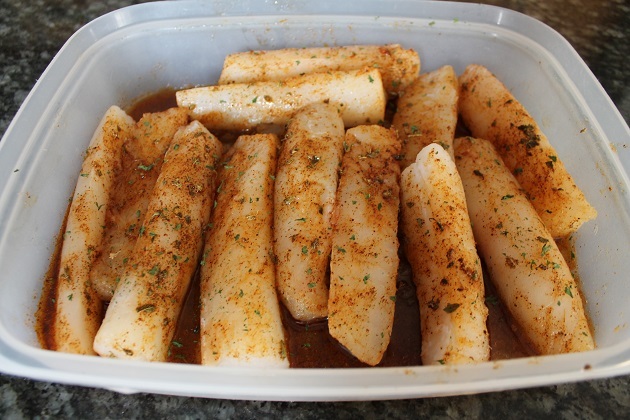 Spread evenly over fish filets and refrigerate for 20 minutes. Heat non-stick skillet over medium-high flame and fry 4 minutes on each side or until fish flakes and is fully cooked. To construct, break up the fish into chunks and spoon some fish onto a warm tortilla. Top with your favorite toppings and squeeze sliced lime on top for an added tang. It was Friday night frenzy in my household this past weekend with the high school musical in full swing. How I get into a mood to create on such evenings remains a mystery. This time I’ll blame it on the weather. It was a snowy day in the Midwest and the only logical explanation I can muster for the blaring call for comfort food. Well, that and the gorgeous filet of Atlantic salmon in the fridge that was screaming Creole. What to do, what to do. Daughter #1’s allergy to all things crustacean struck out Saucy Shrimp and I couldn’t let the cry for Creole go unheard. 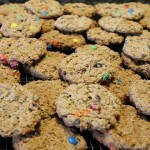 Hence, the birth of my latest culinary creation that I’m happy to pass on to you. 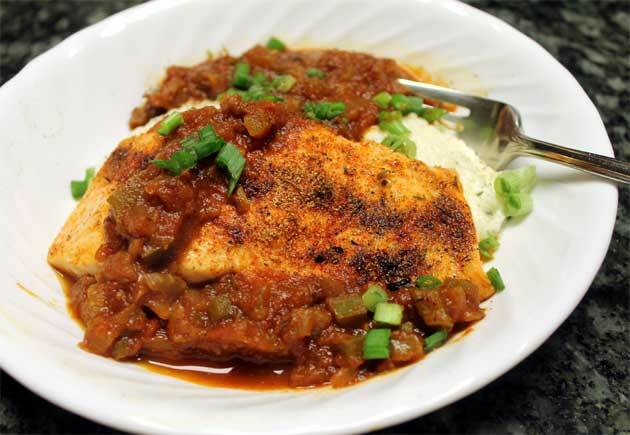 Broiled Cajun salmon topped with a spoonful of rich Creole sauce makes a beautiful presentation on its own over rice pilaf or mashed potatoes. Top it over a heaping helping of cheese grits and it’s over the moon. (In case you missed it, here’s my recipe for a healthier version of cheesy grits that uses quick-cooking grits.) 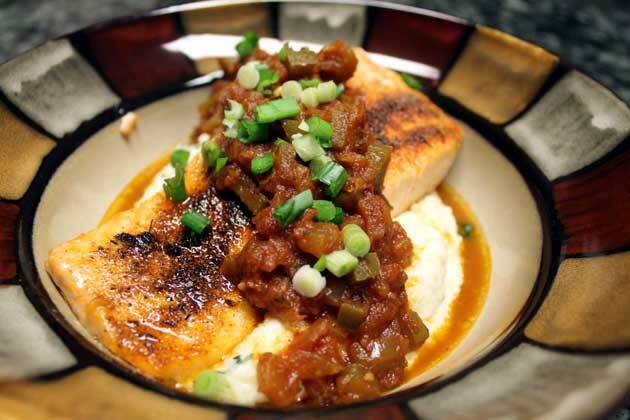 The Cajun rub and Creole Sauce can easily be prepared in advance and while the sauce is reheating prepare the grits and broil the salmon. 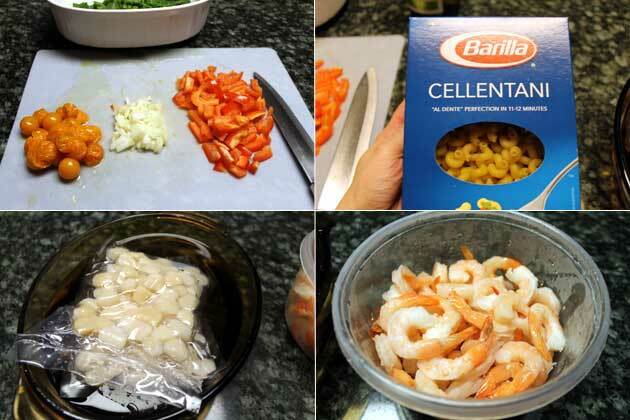 While this recipe may seem daunting, it is actually a fairly quick meal to prepare that is sure to impress in presentation and taste. Broiled salmon coated in a low sodium Cajun rub topped with a rich Creole sauce is sure to send your taste buds flying. Especially when it tops a bowl full of cheesy grits! A meal that gives a warm hug with every bite. The Cajun rub and Creole sauce can easily be prepared in advance. Begin making the Cajun Rub by mixing all ingredients in a small jar or container with a tight fitting lid. Shake well to combine and set aside. Next, prepare the creole sauce adding the olive oil to a medium-sized saucepan over medium high heat. Add the pepper, onion, and celery and cook until the onions become transparent, stirring frequently. Cover with tight fitting lid, reduce heat to medium-low and let it simmer while the rest of the meal is being prepared. If you're cooking in advance, simmer on low for 40-45 minutes. If desired, begin preparing the cheesy grits. Preheat the oven to 400 and then set it to broil, raising the rack to sit just below the broiler. Grease a large baking sheet and place salmon filets skin-side down onto prepared pan. Thoroughly coat the top of each salmon filet with Cajun rub and 3-4 minutes. Set the oven from broil back to 400F and back for another 5-7 minutes, depending on thickness of the salmon. Move over shrimp and grits, Cajun salmon broiled to perfection and topped with a spoonful of rich Creole Sauce is my new found favorite topping for cheese grits. This meal scored high with my resident food critics and Hubby and I had fun morphing into food stylists. 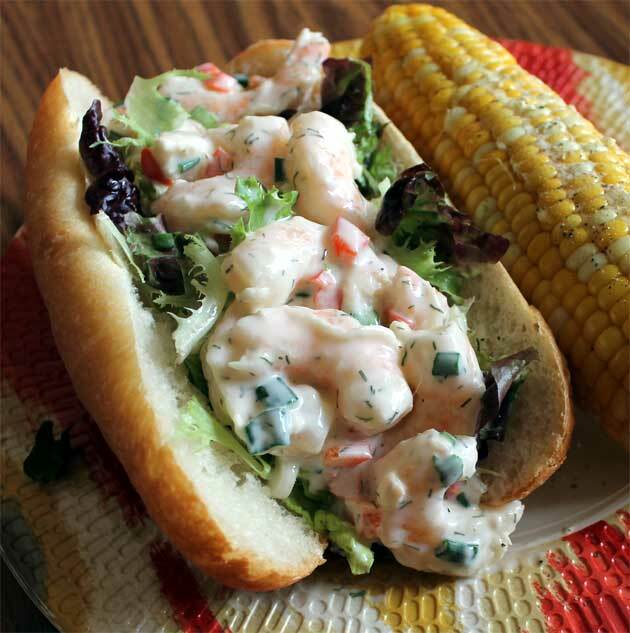 Note: the photo below is Hubby’s spiced up version that has an extra generous sprinkling of Cajun rub. Hey all! It’s good to be back after a long winter’s nap. It’s that time of year when the longing for spring begins to swell inside me as the cold wind still blows outdoors. Weekly email blasts from various seed companies and full color catalogs brimming with pics of ripe produce don’t help. Oh, the torture. With a good 5 inches of snow still covering my garden, and the inevitable one or two more snowfalls still coming before the final spring thaw, the only cultivating I can do is in my kitchen. Last night I decided to dish up a taste of spring in the form of a light shrimp, scallop and veggie pasta in a delicate lemon, butter, and white wine sauce. It’s my pseudo buerre blanc sauce, a riff on the classic French buerre blanc that is loaded in fat grams from copious amounts of butter. I’m sure my light buerre blanc would annoy any classically trained chef , but it is still very palette pleasing and I know my arteries thank me. Yours will too. Stir fry red pepper, cherry tomato halves, and onion until crisp tender or to your liking. 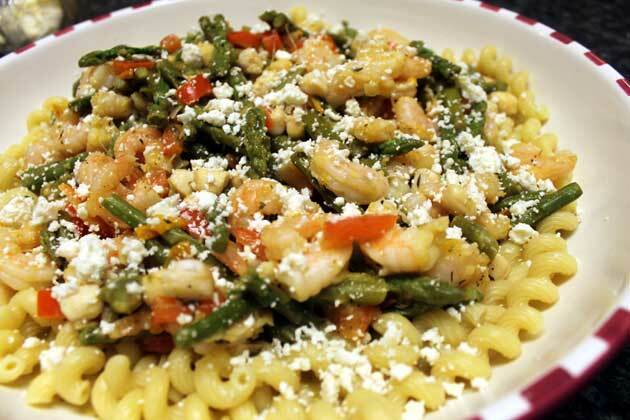 If have fresh asparagus, go ahead and it, cut into small chunks. If you’re in a hurry, or you have frozen aspargus spears on hand as I did, microwave them until crisp tender, cut and then it to the other veggies. Next, add the unsalted butter and dry white wine along with the spices and give it a good stir. The vegetables will soak in the liquid a bit. To remedy this, I added 3-4 large spoonfuls of pasta water as well as the 1/4 C lemon juice. Living up to my “Salt Police” title, I finished this lovely shrimp, scallop and veggie pasta dish with a light sprinkling of feta cheese. It’s a delicious accent to the lemony, white wine sauce. Low sodium varieties are available for sale and a little goes a long way. Prijatno! Enjoy!